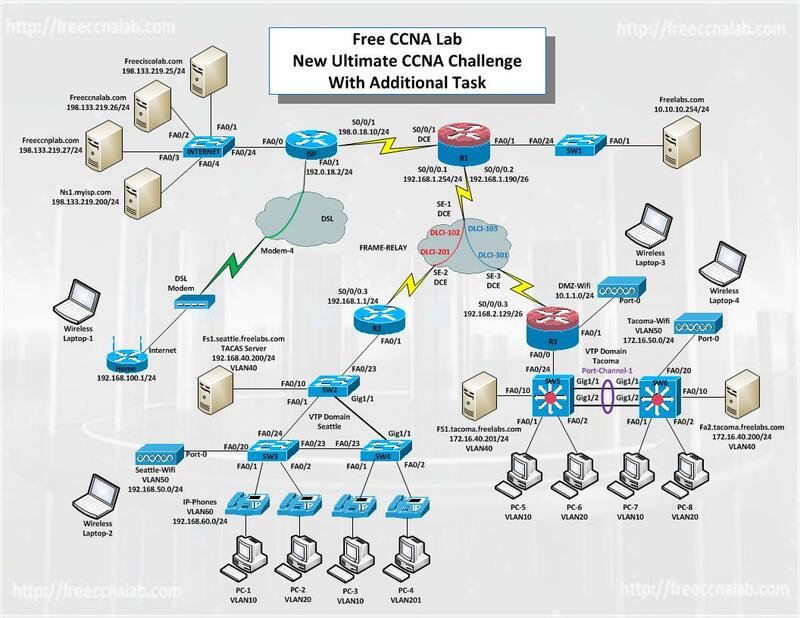 In this CCNA challenge you will be configuring a small company with two sites Seattle and Tacoma, these sites are connected to the internet and their local intranet domain via a frame relay WAN. There is also a remote home office that connects to the internet and the company intranet via a DSL connection to their local ISP. Configure a PAPG port channel between SW5 and SW6 as shown the network diagram. Configure ports FA0/1 and FA0/2 on switches SW5 and SW6 so the only host can be connected insuring that an additional switch can never be connected to the ports. Telephone services need to be configured on the router to configure and assign phone numbers to the four IP phones. Additionally the switches need to be configured to properly trunk the voice and data VLANs. Configure the server FS-1.seattle.freelabs.com as a TACAS server. Configure the server so that it will provide authentication for access to R1, R2, and R3. Configure the user on the TACAS server as Admin with the password “sanfran”. Configure R1, R2, and R3 to use TACAS authentication. Verify R1, R2, and R3 are using TACAS authentication. Verify that you can access R2 and R3 via TELNET from PC-1 and PC-5 and the TACAS authentication is required. In the lab is states that the Tacoma domain should be on SW4 and SW5. I keep getting a domain mismatch on SW4. Should it be SW5 and SW6 are on the Tacoma domain? If so, would SW4 be on the Seattle domain?